Recently I was back in Erewhon for a little while. 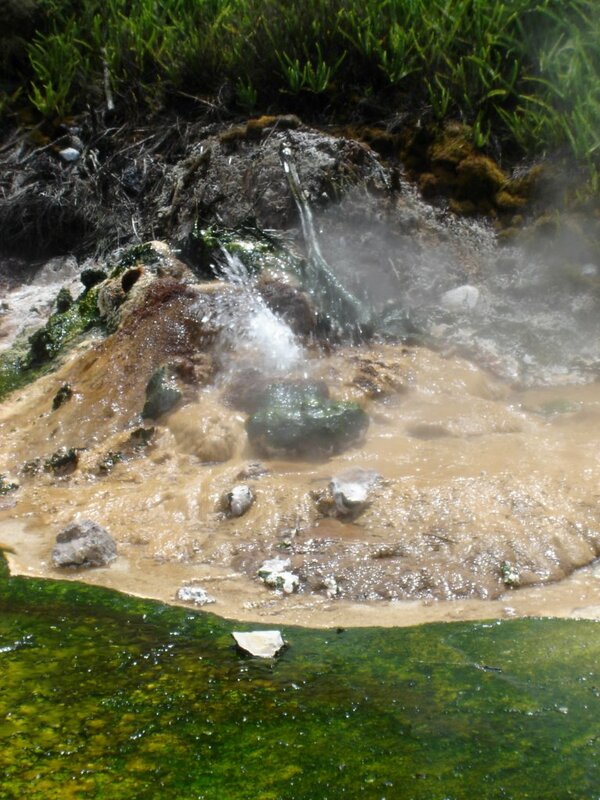 Being part of the Ring of Fire, Erewhon specialises in geological excitement. Earthquakes and volcanos come with the territory. And in places the crust of the planet wears thin. So without further ado -- this is a huge volcano crater. It's actually in the South Island, out on Banks Penisular, near Akaroa. 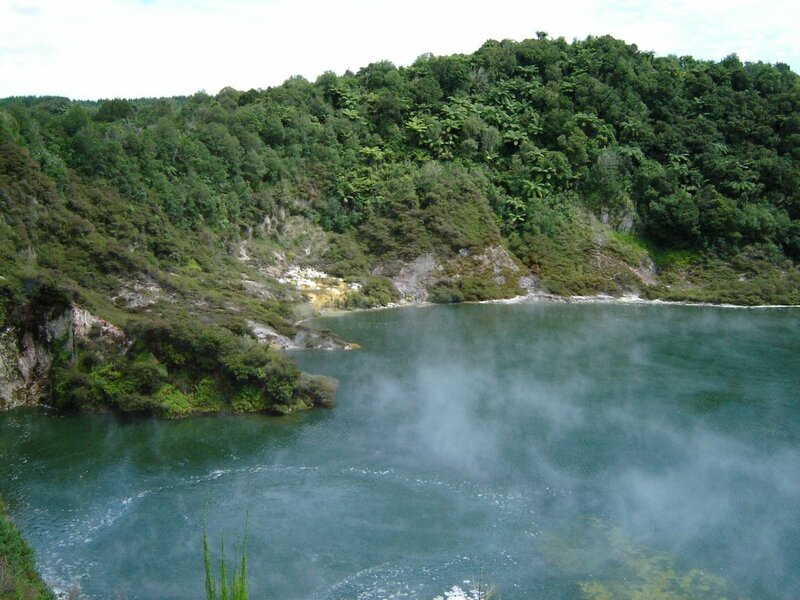 Unlike the volcanos in the North Island, this one has been dormant for a long, long time. 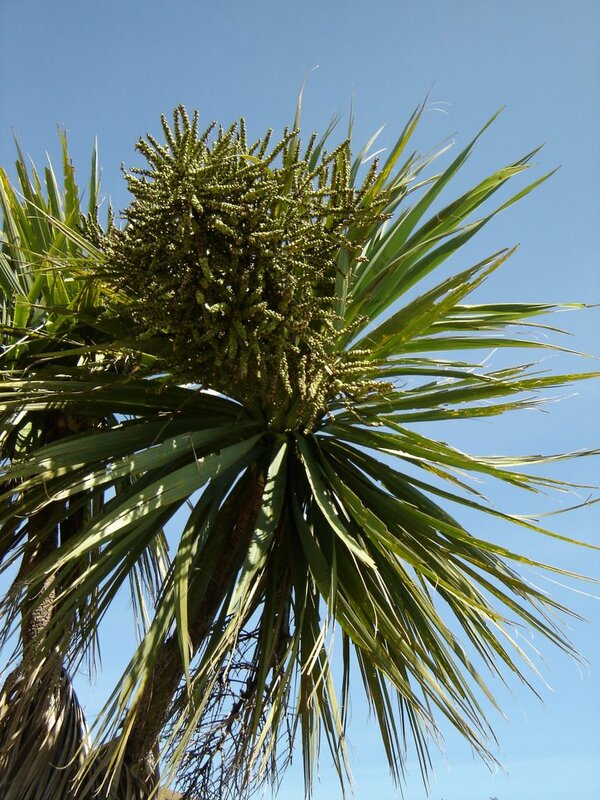 The spiky-looking tree that figures so prominently is called ti kouka or more commonly, 'cabbage tree.' Here's a closer look. This one's in full flower. Like many things from Erewhon, cabbage trees have emigrated. 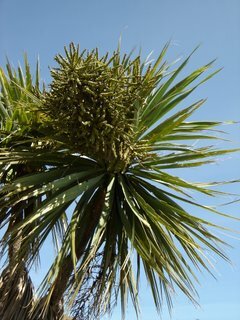 In particular, cabbage trees grow vigorously in the North of England where they are optimistically called "palms" in order to convey the strong impression that Manchester is in fact a warm and balmy sub-tropical paradise -- any snow that you see on the ground is therefore merely a figment of your imagination. 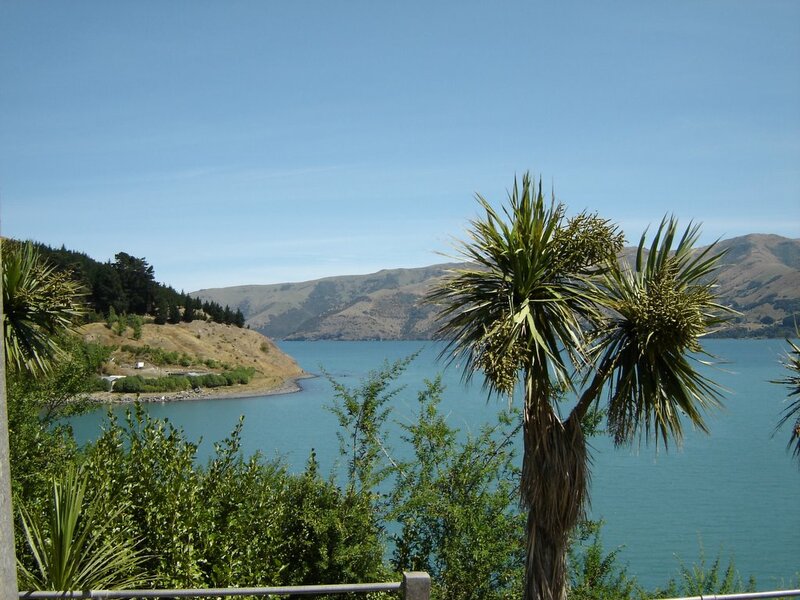 But for real geological excitement (and for real palms for that matter) you have to head up into the North Island. Coming from the South, I'd always been under the parochial impression that it had the more spectacular landscape. Yes -- the North had warmer weather and proper cities that are actually inhabited, but the South had Alps, glaciers, Sounds, fjords, plains, psychotic mountain parrots and a whole lot of emptiness. Parochial impressions are usually mistaken. 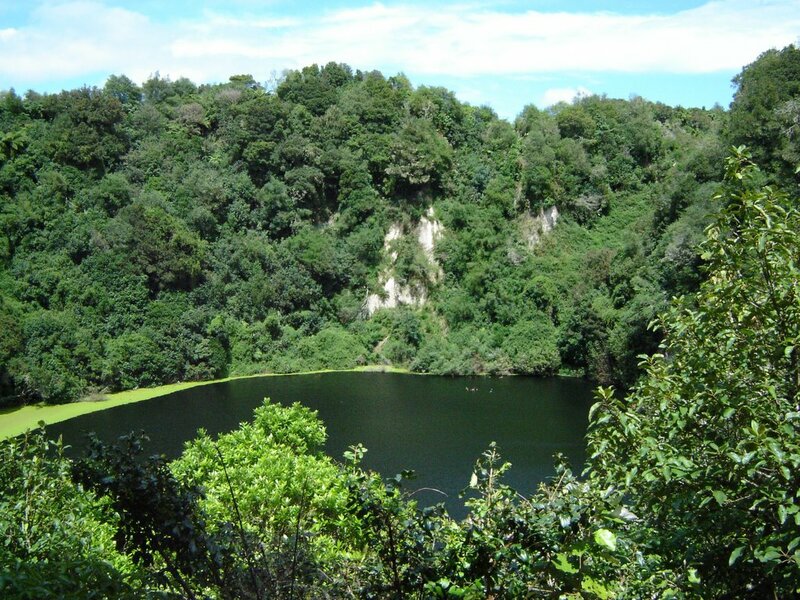 This is Waimangu valley ("Wai" means water and "mangu" means black). On June 10th 1886, this whole area was covered in thick ash when Mt. Tarawera ("burnt peak") erupted, burying the village of Te Wairoa and destroying the Pink and White Terraces. Everything that you see here has either grown back or returned since. The valley is of considerable interest to ecologists because it's a rare example of an ecosystem regenerating essentially from scratch. The mist visible here on the water's surface is not the remnant of an early morning fog: it is steam. Standing on the track above, one could both feel the heat from it and see that, in places, the water was actually boiling. 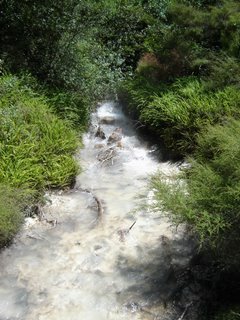 Further down the track, one crosses boiling streams making their way out to Lake Rotomahana. was the way that the plants grew right down to the water's edge. 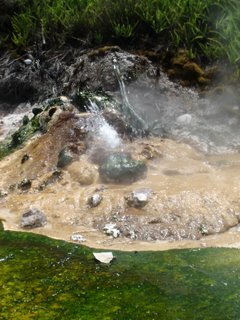 Then there are the miniature geysers. All of four inches high, but thoroughly determined. The vivid green of the water is probably the result of mineral salts, but I've not a clue which specific ones they'd be. Walking through this valley, one can't fail to notice that one is walking atop a thin crust -- like a waterboatman on a still pond. Where the path runs near the stream (or where, at one memorable point, a tiny geyser is forming in the middle of the path itself), one can touch a hand to the ground and observe that it is much warmer to the touch than could be explained merely by the effect of a sunny day.